Renewing our connection to all life on Earth. Reclaiming passion and courage to make a difference in our world. The Work that Reconnects helps us transform fear and despair into inspiration and a sense of empowerment. An innovative process developed by Joanna Macy, internationally acclaimed author, eco-philosopher and activist, The Work helps us uncover and experience our innate connections with each other and with the self-healing powers in the web of life, so that we may be enlivened and motivated to play our part in creating a sustainable civilization. Experience the healing power of gratitude, find compassion in honoring your pain for the world, embrace your connections with each other and with the self-healing powers in the web of life, and realize your potential to make a difference. The Work That Reconnects workshop includes role play, movement, inspirational readings and teachings, and simple ceremonies. This process is engaging, invigorating and gives you tools for dealing with the challenges of living in a world where we are bombarded constantly with local and global crises and causes. 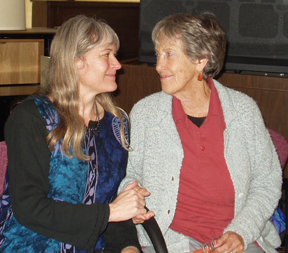 Joanna and Kathleen in 2010. Kathleen is a founding member of the Work That Reconnects Facilitator Network.